This is a rare techy post (and those of you who know me will also know that my techy competence is not so great so apologies for any mistakes). Along with a university partner, Pontydysgu bid for a small contract to develop a system to allow the visualisation of labour market data. The contractors had envisaged a system which would update automatically from UK ONS quarterly labour market data: a desire clearly impossible within the scope of the funding. So the challenge was to design something which would make it easy for them to manually update the data with visualisations being automatically updated from the amended data. Neither the contractors or indeed the people we were working with in the university had any great experience of using visualisation or web software. The simplest applications seemed to me to be the best for this. Google spreadsheets are easy to construct and the interactive version of the chart tools will automatically update when embedded into a WordPress bog. Our colleagues at the university developed a comprehensive spreadsheet and added some 23 or so charts. So far so good. Now was the time to develop the website. I made a couple of test pages and everything looked good. I showed the university researchers how to edit in WordPress and how to add embedded interactive charts. And that is where the problems started. They emailed us saying that not only were their charts not showing but the ones i had added had disappeared! WordPress is using shortcodes for embeds. But there are no shortcodes for Google Charts embed. There is shortcode for using the Google Charts API but that would invalidate our aim of making the system easy to update. And of course, we could instead post an image file of the chart, but once more that would not be dynamically updated. In the end my colleague Dirk hacked the WordPress code to allow editors to post unfiltered html but this is not an elegant answer! We also added the Google code to Custom Fields allowing a better way to add the embeds. So (fingers crossed) it all works. But it was a struggle. I would be very grateful for any feedback – either on a better way of doing what we are trying to achieve – or on the various problems with WordPress and Google embed codes. Remember, we are looking for something cheap and easy! One of my favourite thing about the summer is the cricket test matches. Cricket on the radio is a true joy. And, if no time for the radio, I follow the matches on the Guardian newspaper blog. One of the art forms of both media is what to do on those long periods when nothing happens especially if it rains. And rain it did, on last weeks match in Cardiff! Almost all day until the match was finally abandoned at about 3 in the afternoon. And so resident blogger Rob Smyth resorted to crowd sourcing content. “Something to talk about given that there is bugger all chance of a completed match today”. he said. . ..”what would you put in Room 101 and why?” Don’t know what Room 101 is? Here is the wikipedia entry. I loved the replies about helpdesks. I’m at work on an IT helpdesk as we speak (well type) and the reason we ask if there’s anything else we can help with is because we are told to do so by strict call specs set by the client we work for,” says Miv. “Not doing so can lead to warnings & dismissals believe it or not. It’s not like we actually give a monkeys about the caller or their problems, I’m currently typing this, listening to my iPod in one ear while listening to some poor sod whine about lost emails in the other. A chat about his personal problems would be a godsend rather than take the next call from some muppet who can’t drag and drop. There I said it – I feel better. I like writing position papers! This is the second submission for the Alpine Redezvous workshop on the topic of TEL, the Crisis and the Response. This position paper is co-written with Dirk Stieglitz and Ilona Buchem. However, rather than focus on concerns about the role of technology in the organisation and control of the educational infrastructure, in this position paper we which to examine the potential – and potential contradictions – of technology for learning. This in turn, leads to a focus on pedagogy, defined here as the theory and practice of teaching and learning. Technology is not pedagogically neutral – all technology enhances or hinders particular approaches to learning. 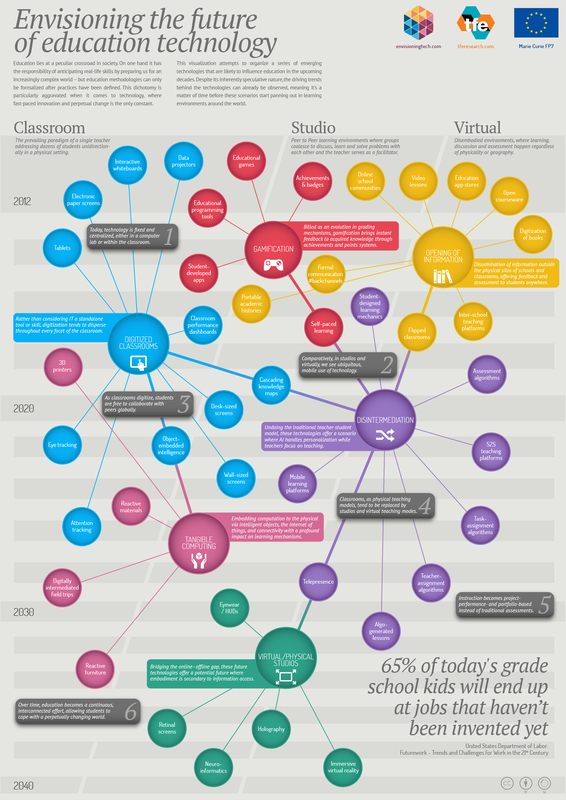 It is not hard to criticize the uses of educational technology in institutions. In its earlier phases technology was used to manage learners rather than facilitate learning. In its latter phase technology is being deployed both to commodify and monetarize knowledge (and the academic labour which produces such knowledge) and at the same time to sell education as just another consumer product (hence the present hype around so called learning analytics). Almost inevitably, attempts to develop an alternative ecology or milieu and an alternative pedagogy – such as MOOCs – are being absorbed by the dominant culture. Interestingly, in this regard, we can perceive the contradiction between an understanding of academic staff who wish to open up new horizons for learning to students with the concerns of the students who wish only to receive the necessary knowledge to achieve the credentials for which they believe they have paid. This in turn reinforces push technologies to support funnel delivery of learning objects to receivers (clients or customers). And despite the hype about the uses of technology by digital residents, repeated surveys have shown very limited use of social technologies by students to create, rather than consume digital artefacts and knowledge. However, there is an alternative perspective. The almost indecent rush to commodify academic knowledge through the use of technology may, to some extent, be driven by a realization that knowledge has escaped from the walled garden of the academy. We would argue that the education systems grew in response to the needs of industrial capitalisms (in this respect it is informative to note that many Victorian schools in the UK were deigned to look like factories and were organised on a factory model). Despite the efforts of communities and organisations such as the Miners Hall, the Workers Educational Association and the Mechanics Institutes (and similar bodies and movements in other countries than the UK), access to education – and knowledge – was largely a monopoly of the education system, which in turn was ideologically driven by the needs of capitalist enterprises. Such learning often took place through contacting friends or through participating in informal, online communities of practice. Support for learning was through peers or those who Vygotsky called a More Knowledgeable Other and learning was largely self-directed. Learning was heavily contextual, depending on both the subject and level of learning, the nature of the problem or the culture of the community. Through a combination of the physical workplace and subject based culture and the culture of the online interactions, users were making new meanings for their own practice. This chimes with Bakhtin’s reasoning that others or other meanings are required for any cultural category to generate meaning and reveal its depths. The interesting point here is the relation to practices, and to dialogical learning processes, as opposed to the reified and top down nature of knowledge acquisition through institutional online learning and traditional TEL. We suggest that if the TEL community is to contribute towards a response to the crisis, that response requires a move from a focus on formal knowledge transmission through educational technology controlled by institutions, to a perspective of supporting community knowledge acquisition and self directed learning focused on practice. It equally requires a change in developmental approaches with technology co-developed with the communities of practice. Interestingly, it could be argued that such a change, although explicitly opposed to the use of TEL to commodify formal education, would provide a better social and economic use of technology in existing economies. Bakhtin, M. (1986). From notes made in 1970-71 (V. McGee, Trans.). In C. Emerson, & M. Holquist (Eds. ), Speech genres & other late essays (pp. 132–158). Austin: University of Texas Press. I am fascinated by the growing use of visualisations (although my own efforts to date are less than impressive). You can download a high resolution copy of the poster from their site. Ilona Buchem and myself have submitted a proposal, Diversity and Divide in TEL: The Case for Personal Learning Environments, for the workshop on TEL, The Crisis and the Response, to be held at next years Alpine Rendez-Vous. The digital divide cannot be discussed only as a gap between technology haves and have-nots. Below the inequalities in access and usage, there is also a problem of a divide between contexts, domains and communities that different learners operate in. The need for empowered learners as citizens engaging in cross-boundary, problem-solving has been advocated as a necessary means for social innovation. It is through boundary-crossing or bridging the divides that individual and sociocultural differences can become a resource. However, mainstream TEL has not fully recognised the potential of boundary crossing and engaging diverse learners in collective action related to solving real life problems. Much of TEL is developed to fit the prevailing educational paradigm, focusing on ever more efficient management of learning and more reliable methods of assessment rather than encouraging learners to explore diverse ideas, experiment with diverse formats or build bridges to diverse communities. Can promoting diversity through TEL be a response to crisis? Certainly, in view of the growing complexity of societal, environmental and economic challenges and the ever increasing amount of information and communication possibilities, diversity may raise new questions, challenges and concerns. However, both research and practice provide evidence that diversity, in terms of individual or group attributes as well as in terms of different content, resources and tools provides valuable opportunities for intellectual engagement, personal growth and the development of novel solutions. In this position paper, we discuss whether current TEL promotes diversity or divide and the current barriers in promoting diversity in TEL. We discuss these issues based on the example of Personal Learning Environments (PLE), which is as an approach to TEL aiming at empowering learners to use diverse technological tools suited to their own needs and connecting with other learners through building Personal Learning Networks. We argue that this approach to TEL promotes diversity through boundary-crossing and responding to the diverse needs and prerequisites that each individual learner brings in. At the same time we discuss how the PLE approach challenges current educational practices and what tensions arise when Personal Learning Environments are implemented in educational institutions. Personal Learning Environments, as an approach to TEL, focus on the learner-controlled and learner-led uses of technologies for learning with no centralised control over tools, information or interactions. This strong focus on autonomous, literate learners as agents and decision-makers taking control and claiming ownership of their learning environments is of course in contrast with regulated and planned processes at schools and universities, demanding radical changes in the prevailing educational paradigm. TEL, based on the Personal Learning Environments approach, vests learners with control over learning processes and outcomes, including planing, content, interactions, resources and assessment. In this way, the PLE approach challenges not only the prevailing educational paradigm, but also TEL approaches inspired by this paradigm, such as Learning Management Systems and pre-programmed, locked-down systems, such as some types of video games or mobile apps, which place learners in the role of recipients and consumers of systems devised by others, while failing to foster both generativity and boundary-crossing. Such pre-programmed, quality-controlled and locked-down approaches to TEL have led to “walled gardens in cyberspace”, isolating different learners and learning contexts, posing external constraints on what learners can do in such environments in terms of activities, resources and tools. Alternatively, learner-controlled uses of technologies, as embodied in the Personal Learning Environments approach, have facilitated boundary crossing and merging multiple learning contexts, domains and communities. The postulate of boundary-crossing through the PLE approach has a human and technological dimension. On one hand, the PLE approach calls for learners to claim and make use of ownership and control over their learning environment, exerting agency in terms of the human capacity to make choices and uses those choices in real world interactions. On the other hand, the PLE approach calls for openness, decentralisation, connectivity and permeability of technological systems. With learner ownership, control and agency combined with openness, decentralisation, connectivity and permeability of technological systems being the core attributes of the PLE approach to TEL, diversity becomes natural. The PLE approach promotes diversity of social interactions, diversity of learning contexts and diversity of learning practices. Personal Learning Environments entail diverse people and communities coming together, diverse technology tools and platforms used and combined by learners, diverse content production and consumption modes, diverse access points and modes of learning. However, diversity promoted by the PLE approach is a source of conflict when PLEs and other systems interact. Specifically, tensions arise at the points traditionally considered as legitimate divides in the education system including TEL, for example (a) private vs. public access, (b) course members vs. non-members, (c) disciplinary knowledge vs. practice-based knowledge, (d) formal vs. informal learning context, (e) expert vs. novice, (f) individual vs. collective practice, (g) assessment vs. reflection, (h) planning vs. implementation, or (i) standards vs. innovation. We argue that challenging these presumably legitimate boundaries in TEL as postulated by the PLE approach is a way to innovation which may bring viable responses to the crises. Last year we organised a workshop on web radio at the annual San Marino International Festival (SMIAF). This year we followed it up by launching SMIAF radio broadcasting directly from the main stage at the festival. Although tiring – I think we put out about 15 hours of live radio – it was great fun. We had a team of four – I directed the broadcasts and co-hosted along with the wonderful Annalisa Schembri from Malta. And Michele Ghiotti! from San Marino, who participated in last years workshop did an amazing job dashing around the different festival sites gathering interviews with performers, vendors, festival volunteers and just about anyone who would stay still long enough to be interviewed. As always Dirk Stieglitz manfully manned the computers and somehow kept the broadcast going out, even when the tangle of feeds seemed mind boggling. Although we have done many live shows from conferences and events we had never broadcast from a festival before. It was a fairly steep learning curve but hard to see how we could have learned so much from another way than just doing it. We learned how important coordination and collaboration with the sound technicians and stage manager is. We failed in advance to realise how long sound checks can take and had to plan our way through that on the go. 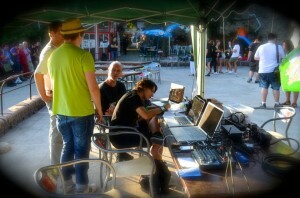 Live festival broadcasts require a great deal of flexibility and very quick decision making. Artists do not always turn up for sound checks at the time they are supposed to, acts do not always stick to the timetable and nor do artists turn up for interviews at the exact time they say they would! One issue which worried us prior to the festival was copyright for music. We could not even find out what the copyright laws were in San Marino. 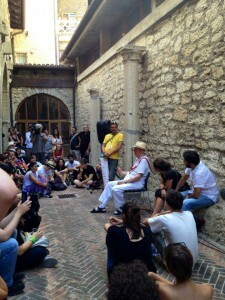 In the event we approached the artists and asked them for agreement that we could use their material. and they all readily agreed. This is not a big festival with super groups. The bands at the festival, just like the majority of performers all over the world, are desperate for any publicity they can get for their music. If people listen to a podcasts of their live performance they may buy their records or just as important may go and see them at a live gig. Indeed a number fo the bands asked if they could have copies of the interviews we made with them. 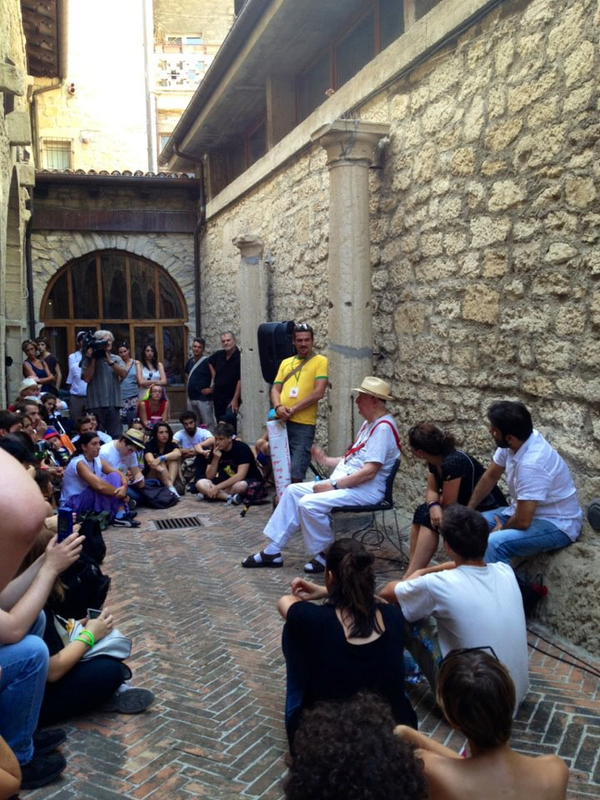 We also recorded a one hour informal discussion between the SMIAF staff and volunteers with Nobel prize winning writer and painter, Dario Fo. Unfortunately my Italian is fairly non existent but the bits a did get sounded extremely interesting. We will be post processing the Dario Fo session, like all the other festival interviews and performances and releasing them on both the SMIAF website and the Pontydysgu site over the next month or so. And we will be very happy to provide copies to anyone who wants them. Finally many thanks to the core organisers from SMIAF, Meri, Matteo and the Tommies for all their help and support. And not forgetting Elio Balestrieri for keeping us supplied with beer!